The Gulf of Mexico Basin is perhaps one of the best studied basins in the world. Most of the work, however, has been concentrated around the periphery of the basin where historically oil and gas have been produced. There is still much to be learned about the deep basin fill as well as how the depositional history of the basin explains and predicts reservoir distribution patterns. 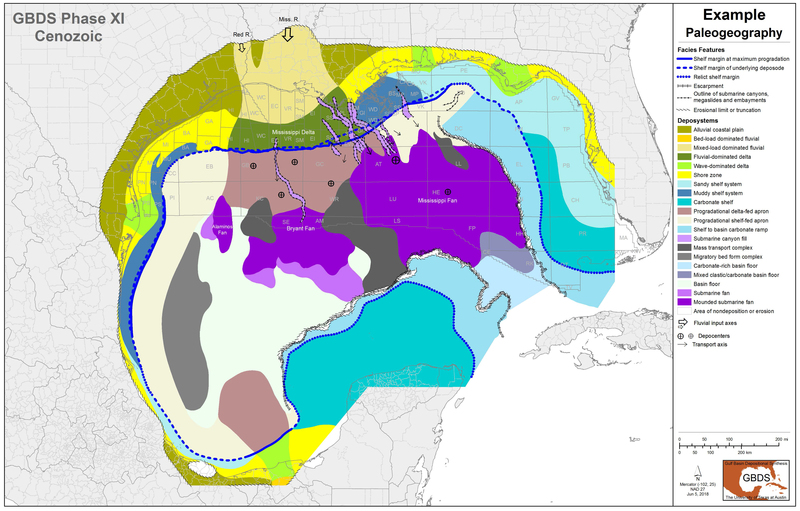 The exploration successes and rejuvenated interest in the Paleogene plays, sub-salt stratigraphy, and deep gas exploration potential continue to make the Gulf of Mexico Basin Depositional Synthesis (GBDS) project especially timely. GBDS is an ongoing, industry-supported, comprehensive synthesis of Cenozoic and Mesozoic fill of the entire Gulf of Mexico Basin spearheaded by The University of Texas Institute for Geophysics (UTIG). The results are distributed as a digital database that is updated regularly. The project has led to major new contributions to the understanding of the depositional history and framework of the Gulf of Mexico Basin. The project has focused on refining sequence correlations between the continental margin and deep basin stratigraphies, mapping sedimentary transport axes and paleogeographies through time, defining the evolving roles of submarine canyons, retrogradational margins, and shelf-margin delta systems in localizing in time and space sand transport to the slope and abyssal plain, and better understanding regional controls on reservoir facies and their deposition. The deliverables for the project include a digital set of regional UTIG multi-channel seismic transects in the deep basin (traversing both U.S. and Mexico waters), a comprehensive GIS database, a suite of regional lithofacies and depositional systems maps generated from the database and compilation of published information, and an extensive supporting bibliography. The maps encompass the entire Gulf of Mexico Basin and currently cover the time period from the early Jurassic to the Quaternary. Also included are a series of regional cross sections based on seismic and well control to illustrate the major geologic features and depositional relationships. These data together provide a comprehensive picture of Gulf-wide sedimentary history. You can also read the latest stories about GBDS research and activities here.